John van Gool started his career as guitar maker in 1978 and finished his first guitar in 1979. His guitars are made by the principles of Antonio Torres, of what he believes give the best result in balance as well as tonal qualities of the guitar. In 1988 he was able to follow a master class in guitar making with the well known guitar maker José L. Romanillos, which was repeated in 1989 and 1992 in Cordoba, Spain. Since 1980 he is, besides the classical guitar, also making flamenco guitars. In 1984 he started to make several types of the lute and after a study and investigation to the Spanish vihuela he is also making this beautiful instrument. 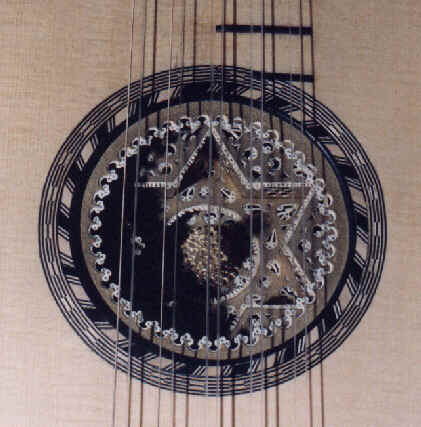 Since 1995 he is making Baroque guitars with beautiful inlays and originally 3D rosette. The instruments are characterised by a great volume and a very comfortable playing facility for the left and right hand. All guitars are made to the Spanish traditions, jointed to the present acoustical insights. Of course only the best woods and materials are used to make this beautiful instruments. Because of the fact that the instruments are made in the Spanish tradition, i.e. one instrument at a time, the number of instruments produced is limited.